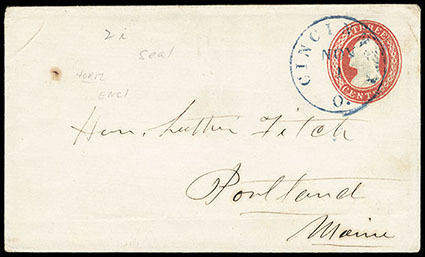 Envelope, 1853, 3¢ red Nesbitt Group, group of 6 comprising U1 (UPSS 2 Die 1) early printing on horizontal laid paper cancelled by blue "Cincinnati. O. Sep 15" cds, U1 (UPSS 1a Die 1) rare horizontal laid paper variety cancelled by "Cincinnati O. Nov 1" cds, U1 early 1853 docketed use cancelled by "Richmond Va. Jul 9" cds; plus includes two U2 used entires and U19 and 1853 P.O. Dept. stamped envelope distributing form for $47.90 of stamped envelopes, some faults, F.-V.F. and scarce group. Scott No. U1, U1 var. Estimate $400 - 600. 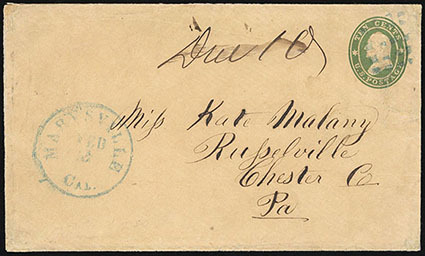 Envelope, 1860, 10¢ green on buff, entire cancelled by blue grid cancel, matching "Marysville Cal., Feb 2" cds to Russelville PA., manuscript "Due 10" rating for double rate; repaired tear affects indicia, Very Fine and scarce California Star Die use. 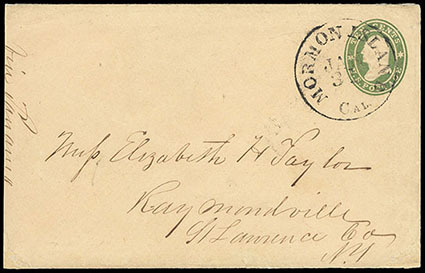 Envelope, 1860, 10¢ green on buff, entire canceled by "Mormon Island Cal. Jan 31" cds to Raymondville N.Y., endorsed "Via Panama" at left; reduced at left, otherwise Very Fine and scarce California Star Die use. 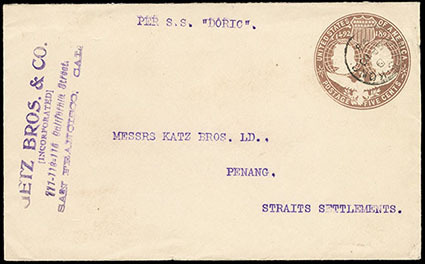 Envelope, 1893, 5¢ Columbian, cancelled by "Hong Kong, SP 10 '98" cds addressed to Penang, Straits Settlements; typed "Per S.S. 'Doric'" endorsement at top, San Francisco corner card handstamp, "C, Penang, SP 21 '98" arrival backstamp, fresh and Very Fine, a rare use abroad from Hong Kong to Penang. Scott No. U350 Estimate $200 - 300. Envelope, 1915, 2¢ carmine, die 1, double impression, size 21, knife 100, watermark 22, with second impression to right wrapping over to reverse, printed corner card, entire, negligible soiling and tone as always, Very Fine for this; with 2010 Weiss certificate.